I was wondering what the clear material is that is over the actual hand movement part of the watch. Thank you! It is a scratch and shatter resistant mineral crystal lens. Can you add that image with saying in script with our wedding date underneath 10.22.16? I attached the image. Thank you. Would it be possible to email us the logo in black and white? We should be able to engrave it but we would need it in black and white. We're so sorry, this is a java script issue. We always center your engraving, left to right and top to bottom so please don't worry if the proof looks off center. Is this pocket watch only for men? I see that the majority of the reviewers bought it for their men/boyfriends. This pocket watch can definitely be used for women too. It has a diameter of 1 5/8" so it is on the smaller side. I have a logo I would like engraved on the front. Is this possible? And how long for processing and shipping? Yes, you can just email the logo to help@executivegiftshoppe.com. 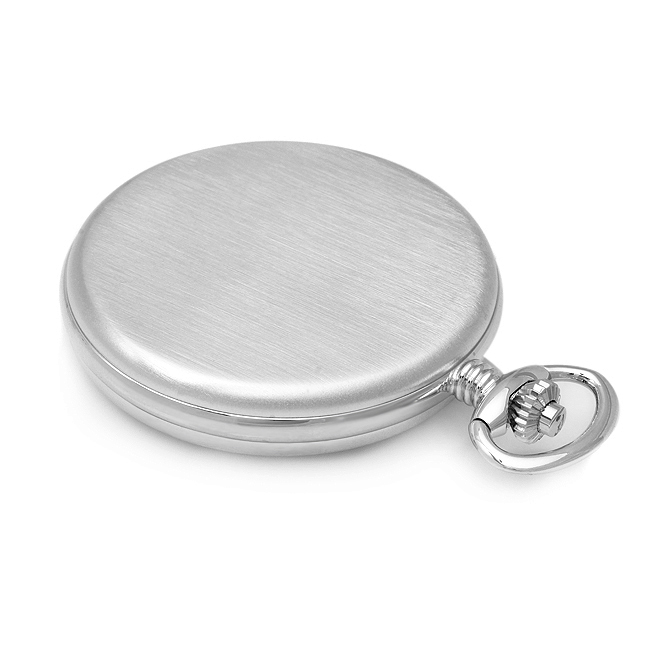 Let us know the pocket watch you're intested in and attach the logo in black and white format. We'll email you a rough proof. If that looks good, you can proceed with placing your order. We can do this for you but the engraving would have to be very small. If that's alright, just type what you'd like engraved on this pocket watch in the comments section of our checkout page. I am interested in buying this watch for my fiance as a wedding gift. I want to get it engraved with his family coat of arms. I am aware that this may be more than your normal engraving and I am willing to pay extra if necessary. I have attached a picture of the coat of arms (I would want it without color of course) Could you please tell me if this is possible? Thank you for your time. We could possible do it but we would need the Coat of Arms in black and white line art format. Is it a possibility to get it to us in that format? Please let us know if you need a little more clarification on the format. Thank you for your reply. 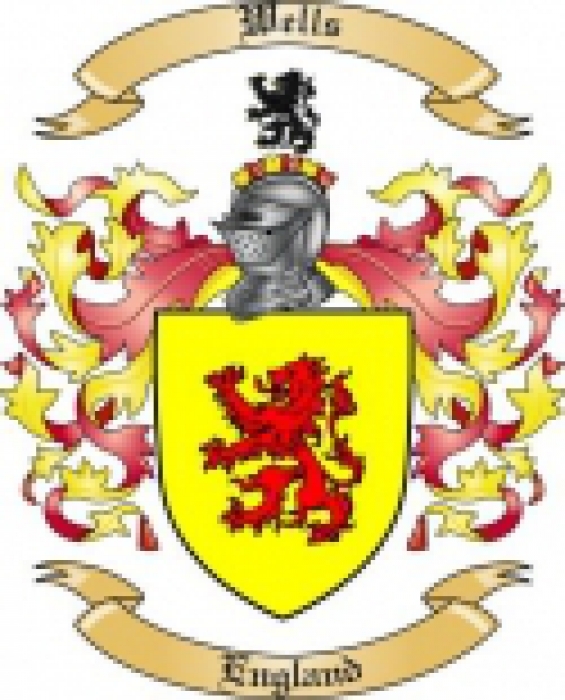 I have attached a black and white outline of the wells coat of arms. Please let me know if this will work. Thank you very much for your time! I want to order this watch and have added in my personal message for engraving, however once "in the cart" the order is showing the message to ALL be on the 'FRONT' side. But when typing it the order page is reads FRONT and BACK side engraving. AND the "preview" shows front and back. Can you tell me if this will indeed be engraved on BOTH side or just the FRONT side. I would like to know before I place the order. As I stated it is not reading like that in the cart. I'm so sorry for the confusion, in the cart it does not show whether the engraving is on the front or back but it will be done exactly how you confirmed it before adding it to the shopping cart. After you place your order, if you're unsure at all, you can reply to the email confirmation you'll receive and request a proof before engraving. Thanks! What can I compare to this watch for size purposes? The diameter is 1 5/8" across. I hope that helps! Does this watch have a warranty? And if so, what kind of warranty? 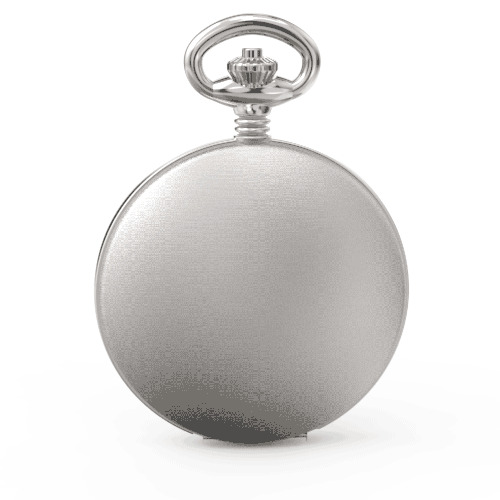 This pocket watch, along with all of our pocket watches, has a lifetime warranty. Is the watch sterling silver or just silver in color? It is silver in color and made of brushed stainless steel. Where can I see what exactly the font looks like? I know front and back is available, but – would it be possible to engrave on the inside of the front covering? Meaning on the space opposite from the face of the watch? If you check the Personalize It box, you'll be able to enter the engraving you'd like for both teh front and the back. Check the Preview Personalization button below where you enter the text to view what it will look like and edit it if you'd like to. We can't engrave the inside of the pocket watch, sorry, there is a swirled pattern there that can't be engraved over. Regarding the engraving locations: Does "back" mean the inside of the cover, or the actual back of the watch? The inside cover can't be personalized, it has a swirled pattern that can't be engraved over. The back means the back of the watch itself. If I choose monogram, will the message come out ok? The monogram fonts are made for 3 letters exactly, they won't work otherwise. If you'd like to engrave a monogram and some text, choose the monogram font and enter 3 letters for the first line (First Initial, Last Initial, Middle Initial). Then enter your text and let us know in the comments section of the checkout page what font you'd like to use for the text. I am planning on buying 7 of these all engraved. Can I get some sort of deal on them? Perhaps a military discount? Sure, just enter the coupon code egscoupon110 to receive 10% off your order ($250.00 minimum). is it possible to have the inside engraved? 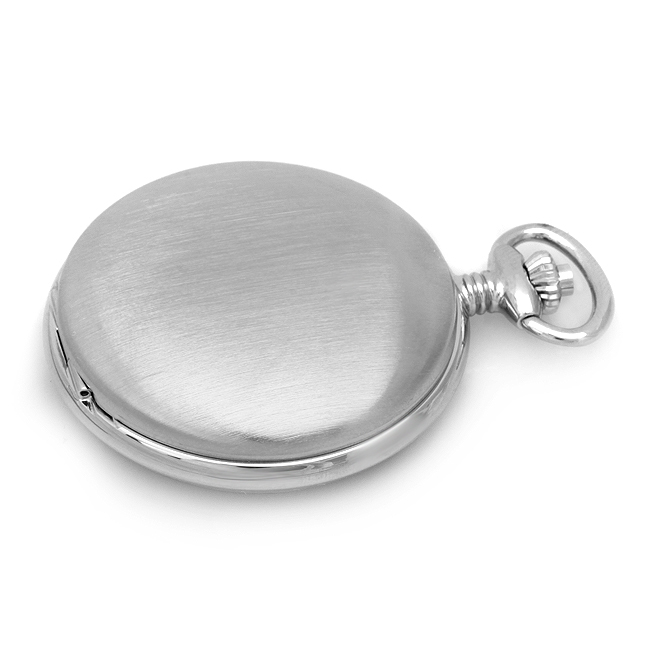 Sorry, it is not possible to engrave the inside cover of our pocket watches. They all have a swirled pattern that can't be engraved over. What fonts are available to use for the engraving? 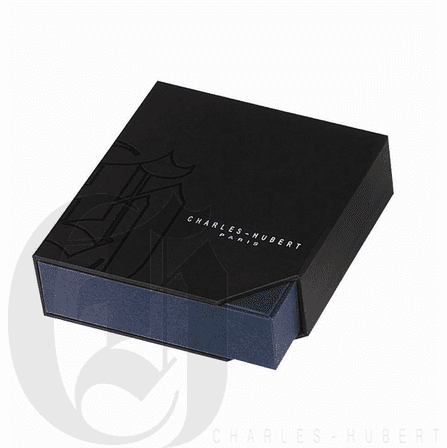 Just check the Personalize box above the Add to Cart button on this item page and you'll be able to enter your engraving, choose your font and preview what it will look like. Does the watch come with the chain? 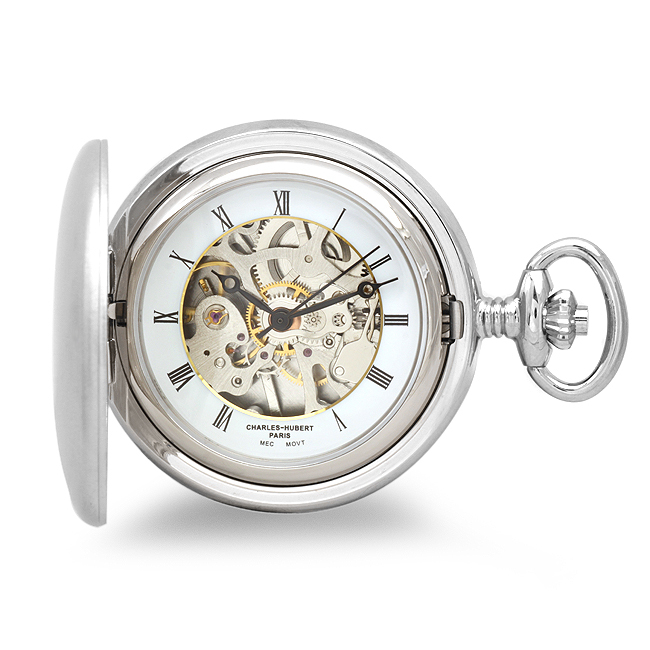 Yes, this watch comes with a 12" pocket watch chain. Do you center the words? Or do I have to center it? 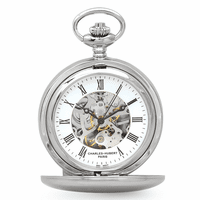 We always center the engraving on all of our pocket watches both left to right and top to bottom. Does this pocket watch includes batteries? Does it come in a presentation box? Can the box be engraved? If I don't choose standard shipping, is there extra charges? Is there any way to see a preview of my final product with the personalization engraved? It does include batteries and come in a presentation box. The presentation cannot be personalized. We do offer faster UPS methods and there are extra charges. You can see the extra charges on our billing/shipping page by choosing the shipping method and hitting apply. If you'd like to see a preview of the final product, just let us know in the comments section of the checkout page that you would like to have an engraving preview emailed to you for approval. Hi, is the engraving done by hand or machine? Is it possible to have part of the message done in Chinese characters? All of our engraving done on our pocket wacthes and in fact on all of our products, is done by machine. Unfortunately we can only engrave in English letters and numbers. The diameter that's listed, 1 5/8", is that the face diameter, or the case diameter? 1 5/8" is the diameter of the case, or whole pocket watch. The face covers almost the whole pocket watch though. 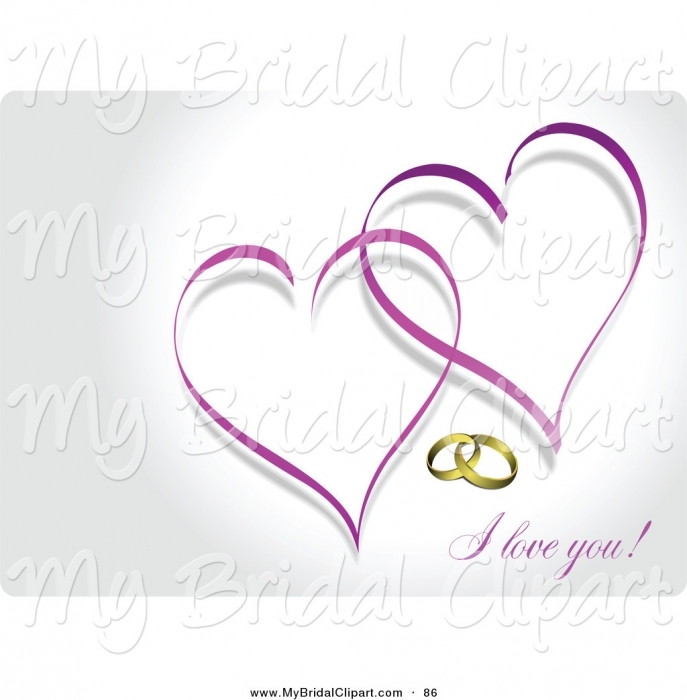 Can you engrave an image - jpeg provided? 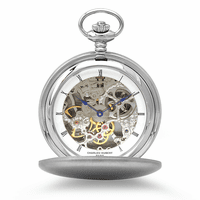 We can only engrave logos or images on orders of 10 pocket watches or more. If you need that many, email us at help@executivegiftshoppe.com with a copy of them image. startling. I am now a Charles Hubert advocate and a EGS customer. ProsCrisp construction and keeps good time. The item was smaller than I expected and I did not receive a proof as requested. It was delivered very quickly and I love it. I can't wait for my husband's birthday, I think he will love it as much as I do. It was a bit smaller than expected but other than that, it's a solid piece that should hold up over time. ProsDurable, could be personalized and classy. ConsSmaller than most pocket watches. Nice gift watch. Good price. All went well, from ordering to special engraving to receiving on time. Thanks. I got the pocket watch incredibly quick despite having engraving on both sides so that was nice. I should have paid more attention to the size of the produce however because it is much smaller than 99% of all the other pocket-watches I've ever seen, I don't like the size at all but overall it's a pretty watch. I bought for my partner and he loved it. The look of the time piece is lovely. I only rated the water four stars because the inscription I wrote was too long and therefor too small to read. Other then that completely satisfied! What is this watchi forr my husband for Christmas it was just as expected. Nice watch, no problems so far. It's smaller than my last watch but fits in my pocket better and I take it everywhere, everyday. FIVE STARS ACROSS THE BOARD!!! Excellent product, customer service and fast shipping!! Perfect ! Surpassed my expectations ! I was very pleased with this watch. It shipped to me so quickly and the way it came packaged was perfect! We bought this for a friend due to his grandfather's passing and it almost brought him to tears. 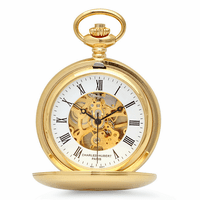 I recently bought this pocket watch for my husband birthday and it was absolutely beautiful! The engraving was perfect. It was shipped just in time and he loves it! The watch itself is beautiful but be sure to pick large text if you are choosing script writing. I did preview before my purchase however it is almost illegible on the watch. Such a bummer as I don't think my husband will be able to read it. ProsBeautiful , nicely packaged . ConsEngraving of script is hard to read . I ordered this pocket watch as a gift for my new husband on our wedding day. My first package was lost in the mail and customer service kindly shipped a new one right away. I am very happy with the quality of this pocket watch, it will be a keepsake that our children and grandchildren will cherish forever. Was smaller than I expected but a very nice gift for my husband on our 25th anniversary. Came within a few days of placing the order. I purchased the watch as a graduation gift for my son. I am very please with the purchase. The engraving made a wonderful person touch to the gift. ProsGood watch & good customer service. ConsThe price was a little high for me. I love this pocket watch. It is such great quality. I also loved the presentation with the packaging. Also, the inscription came out beautifully, it is perfect. I got this for my partner for his birthday and he loved it. My only complaints are that it is a little on the small side and that the side of the chain not connected to the watch could have been a little more secure. This watch is very well made and looks beautiful. Its a little smaller than I thought it would be, but I don't typically know what size these generally are made in. I got this watch engraved on both sides and it came out very legible. The face closes very nicely and the chain feels very sturdy. Happy with my purchase! We were very pleased with the quality of the watch and the engraving. The text size was just a bit smaller than we thought, but overall still beautiful. A gift for my husband. Arrived in 48 hours and the engraving was beautiful. The quality and workmanship of the watch was far above what I expected. Would order from this company aqain. I ordered this for my husband's twenty-fifth birthday. This was my first gift to him since we were married, and I wanted something special and memorable that could be used but also kept for many years. The Executive gift shop was wonderful; they were helpful over the phone to discuss the engraving (incredible deal on that, by the way), and the watch was shipped and arrived just when they said it would. The engraving is perfect; the watch runs beautifully. My husband LOVED it. He liked it even more than I thought he would. He couldn't believe the finesse of the gift. Thank you so much for a wonderful product! I bought this as a gift for my boyfriend. I was very pleased with its quality. It feels solid and a generally pleasing design. I absolutely love that I could get it engraved from the same shop, and it looked exactly as I wanted it too. If I hadn?t read the other reviews, I wouldnt have known that this watch is on the smaller side, but I find it to be just about right. Definitely recommend this piece.